We practice and play our games at Almond Terrace, Whitecross. This is the team we have fielded over the past seventeen years. The Broncos have been one of the top ten teams in the UK over the past three to four years. In 2018 we will be playing in the new Premier Conference North, a new higher level league created to allow the top teams to play more competitive matches. With the success of the Broncos and with an expanding squad of players, the Club have been on the verge of creating a second team for a couple of years. With the creation of the Premier leagues for Flag, this seemed like an ideal opportunity. The Colts will initially play in the Dive 1 leagues against other developing teams. The Colts is an ideal team for new players to join as they learn the skills required to play Flag Football. As a player’s skills progress, they will have the opportunity to play with the Broncos in the Premier League. Grangemouth Broncos have evolved over the years. They started out as the Forth Valley Generals, an adult American Football Club formed in the late 1980s. The Generals then transformed into the Falkirk Cougars around 1990, playing first at Sunnyside in Camelon, then at Inchyra Park in Grangemouth. Around 1995/96 the Cougars became the Denny Broncos, still playing American Football. However, somewhere between 1996 and 2000 the club turned to Flag Football, which initially allowed for some amount of pushing and blocking at the line of scrimage. 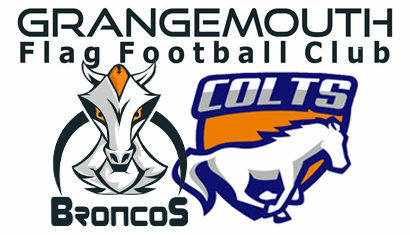 In 2000 the club was back at Grangemouth but had re-invented itself as the Grangemouth Broncos Flag Football Club. At this point, the club rapidly expanded and had teams playing at all age bands. Players ages at that point ranged from 6 to 45. The Broncos kids teams at this point were amongst the most successful teams in Britain. We had teams who won the Scottish Championships and one team who won two national titles and competed in Europe. Many of the Broncos players, of all ages, represented Scotland with some going on to play for Great Britain. More recently, with the demise of the NFL Europe, the under 16 American Football scene has fallen back somewhat and the number of kids playing flag has dwindled in Scotland to virtually nil. Now, the Broncos Senior team continues to go from strength to strength as they reap the rewards of the earlier program as some of those youngsters from the early 2000s make their mark in the adult team. The Broncos are now amongst the best teams in Britain in the BAFA Adult Flag League. The Club is always on the lookout for New players, so, come and join us at one of our practices. We practice most Saturday mornings (unless there are games or international commitments) from 10:00 until 12:30 at Almond Terrace, Whitecross. If you want to play for the Colts or Broncos you must be 16 or over. Males and females are equally eligible to play for the teams. There is a competition for ladies-only teams, but the Broncos don’t yet have enough females to commit to that. i’m Intrested in getting back into football. I’ve been out for a season due to injury, and i’m not quite ready to be back to full contact yet but i’m looking to hopefully join a flag club for a season to get me back in my stride. i played for EKP Juniors and then half a season with senior team. I played Wideout at senior and when i played flag (quite a while ago now) i was a free saftey. Was wondering if there what days you guys train/play and if there was any room on the team? Hi Cammy, I know you got a response from the Facebook page, but thought I would respond to this post too. We practice most Saturday mornings 10:00 – 12:30 at Almond Terrace, Whitecross. Now is a perfect time to get involved since we are expanding to two teams. We should have a practice this Saturday, 25th Nov. For December, we are not planning any practices. 2nd of December is currently a day out for the players, 9th of December we may be arranging a social game depending on the weather, 16th Dec, we will be at Grangemouth Stadium for a Combine day. Then it is Christmas. In January, again depending on the weather, we hope to get back into practices as early as possible to prepare for the Flagging New Year tournament. All of the above dates should be confirmed on the Facebook pages prior to each weekend. Hi Cammy. You still interested in playing flag? Our practice should be ON this weekend (depending on the weather). Let me know if you are likely to be there and I will keep you up to date.